El Salvador is located in Central America. El Salvador is bordered by the Pacific Ocean, Guatemala to the west, and Honduras to the north and east. Google Earth is a free program from Google that allows you to explore satellite images showing the cities and landscapes of El Salvador and all of Central America in fantastic detail. It works on your desktop computer, tablet, or mobile phone. The images in many areas are detailed enough that you can see houses, vehicles and even people on a city street. Google Earth is free and easy-to-use. El Salvador is one of nearly 200 countries illustrated on our Blue Ocean Laminated Map of the World. This map shows a combination of political and physical features. It includes country boundaries, major cities, major mountains in shaded relief, ocean depth in blue color gradient, along with many other features. This is a great map for students, schools, offices and anywhere that a nice map of the world is needed for education, display or decor. 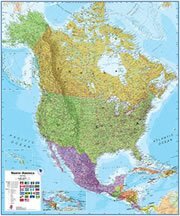 If you are interested in El Salvador and the geography of Central America, our large laminated map of North America might be just what you need. It is a large political map of North America that also shows many of the continent's physical features in color or shaded relief. Major lakes, rivers, cities, roads, country boundaries, coastlines and surrounding islands are all shown on the map. Acajutla, Aguilares, Ahuachapan, Apopa, Armenia, Chalatenango, Chalchuapa, Citala, Cojutepeque, Comalapa, El Carmen, El Triunfo, Elcuco, Ilobasco, Intipuca, La Canoa, La Hachadura, La Herradura, La Libertad, La Union, Lislique, Llobasco, Los Cobanos, Metapan, Nueva Concepcion, Nueva San Salvador, Olocuilta, Puerto El Triunfo, Quezaltepeque, San Francisco, San Miguel, San Salvador, San Vicente, Santa Ana, Santa Cruz, Santa Rosa de Lima, Sensuntepeque, Sesori, Sonsonate, Suchitoto, Tejutla, Usulutan, Victoria and Zacatecoluca. Bahia de La Union, Embalse Cerron Grande, Goascoran River, Golfo de Fonseca, Lago de Coatepeque, Lago de Guija, Lago de Ilopango, Lempa River, Pacifc Ocean, Paz River, Rio Goascoran, Rio Jiboa, Rio Lempa, Rio Paz, Rio Torola, Torola River and Volcan de Izalco. Natural resources for El Salvador include petroleum, arable land, geothermal power and hydropower. El Salvador, which is known as the Land of Volcanoes, has natural hazards which include frequent and sometimes destructive earthquakes and volcanic activity. The country is also extremely susceptible to hurricanes. 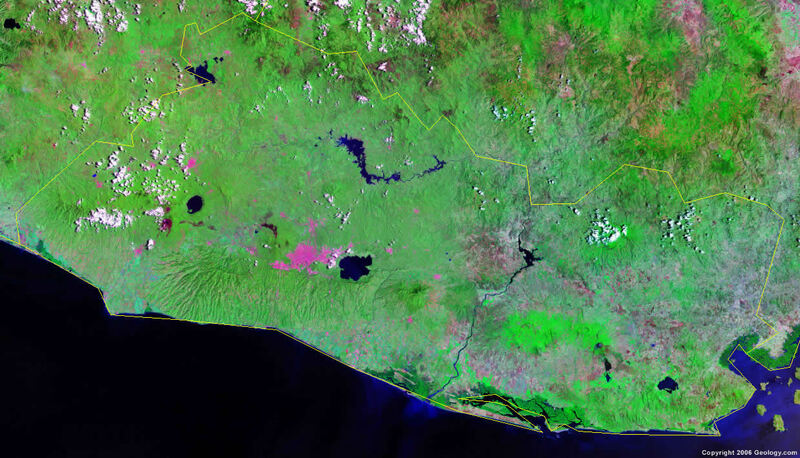 Environmental issues for El Salvador are water and land related. These include contamination of soils from disposal of toxic wastes. In addition, the country has soil erosion and deforestation. El Salvador also has water pollution.